depends on the show, but the Alladin show is good but pretty dated jokes. The title of the current (and longest-running) show at the Hyperion Theater is Aladdin - A Musical Spectacular. And spectacular is what this show is. Disney pulls out all of the stops in this Broadway-quality show, with a condensed yet completely understandable version of the film that includes, I believe, each and every song. It is all packed into a 45-minute stage show that is truly exceptional. The scene changes are flawless, and there are some really advanced special effects, most notably the magic carpet ride above the audience. I also like the transformation of Jafar into a giant serpent, as well as the performance of the genie of Friend Like Me. 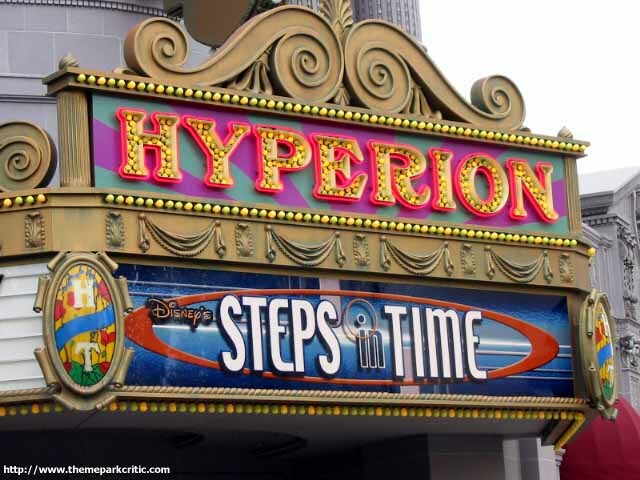 Unlike the previous two shows that played at the Hyperion Theater (Steps in Time and Blast, both of which I thought were quite awful and thankfully did not run for very long), this is the type of first-rate entertainment that I would expect from Disney. If you are not impressed by this show, I think you would fail to be impressed by anything. 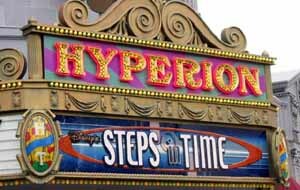 It does sound like the curtain will soon be closing on Aladdin at the Hyperion, to be replaced by another show during the renovation of California Adventure. I have heard rumors about both a Tarzan and a Toy Story show. Whatever they choose, let us hope that they maintain the quality of Aladdin, and not revert back to the Steps in Time or Blast garbage. The last time I was there, they were showing Aladin. I thought that the show was very good, and the jokes were funny, too. Even though the show is good, it is only worth going on once because of its length and everything else at the park. It was pretty cool but it was a little long for my taste. Normally when I go to an theme park I want to do what I have to and get it over with. The Hyperion was a slight waste of my time lasting about 50 minutes. Nice theater, ok shows, too boaring for me though. I recently saw the new Aladin show in here, and I thought it was very good. It was the best show I ever saw, until i went to Knotts and saw the Mystery Lodge one though. The best show at California Adventure. I thought Blast would be alot better, didnt impress me. The theater also looks slightly tacky and the walk up the stairs to get to the upper "deck" (other than exhausting) lets you see all the surrounding area, spoiling the magic of being in a disney park. The theater is very nice; BLAST was awful. The door monitors wouldnt let people out and the show was very loud. My sister and I both developed very big headaches after the show and that pretty much spoiled the rest of our day at the park.